Did you ever have a friend that you trusted completely – the kind of friend whose pinky swear really meant something? And beyond being trustworthy, did you have a friend who could look at you in all of your awkwardness and still love and forgive you ALL the time? As we (Matt & Laura) contemplate Life Together, it’s pretty clear that this is how we are called to be in relationship with one another. It’s an ancient kind of relationship. It’s the relationship that existed between God and the Israelites in the Hebrew scriptures. It’s the relationship Jesus worked to create with his disciples. It’s the relationship Paul called for in the church communities of Corinth and Phillipi and Rome. These ancient relationships are a kind of interdependence and interrelatedness – yin and yang – blood oaths – covenant. Wow…those relationships are hard. And maybe it’s our imagination, but they seem harder for adults than for children. This week’s lectionary reading hinges on the story of the sacrifice of Isaac, another difficult text from Genesis. At first read, this seems like a story about Obedience…perhaps even fearful obedience. 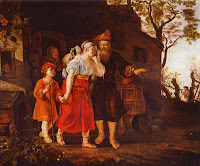 God summons Abraham and sends him out to a mountain to offer up Isaac, his only son – the son promised to Abraham and Sarah by God himself – as a sacrificial offering. But a further reading this week revealed a new detail. You see, the Hebrew scripture is a little short on narrative description at times. Every word is packed full of meaning…if a word is there, it is there for a reason. If a detail is missing, it probably isn’t important to the story. At the center of the story, Abraham has packed up the wood and the donkey and Isaac and two servants and headed to a mountain in Moriah. At a point, Abraham turns to his servants and tells them to stay where they are with the donkey. “The boy and I will go over there; we will worship, and they we will come back to you.” Wait a minute. Abraham tells these servants that they will both return to the appointed spot. It is as if he knew that God really wouldn’t require a sacrifice of Isaac. This opens up all kinds of questions. Does God test us? (Well, there was that incident with Jesus in the Wilderness for 40 days and 40 nights.) Does God change his mind? (Well, Adam and Eve actually got to leave the garden with their life.) Is there space in our relationship with God for testing and bargaining? (Well, there is that time Elijah pleads for the widow’s son.) Maybe, just maybe after all they had been through in their relationship, Abraham knew that Isaac wasn’t the burnt offering. Or maybe, even knowing what he heard from God, he could not imagine anything else than to return to the donkey and his home with his precious son. One way or the other, Abraham was in relationship with God and trusted God enough to follow. And Isaac was in relationship with Abraham and Isaac trusted his father that when a sacrifice was needed, one would show up. The psalmist is giving voice to a give and take relationship with God. In six quick verses, the dialogue ranges from lament and doubt to thanksgiving and praise. Even in the face of death and defeat, he continues to trust God's watchful eye to care for him. Obviously, there is a deep trust and a deep longing to continue to be in relationship with God...even though at that moment, it seems he feels like he has been forgotten by God. How quickly relationships cycle! This excerpt from Paul’s letter to the church in Rome always makes us giggle a bit. It’s a little bit like a conversation with a child. Just because you didn’t get in trouble for doing something inappropriate doesn’t necessarily mean you should continue doing it! (C’mon, you’ve probably had that conversation with a kid, right?) Really, if you wade through Paul’s difficult imagery of slavery and tough use of words like sanctification and righteousness, he’s really driving home a point about relationships. Sure, you could receive God’s grace through Jesus Christ and keep living the same old life…but to truly be in relationship, you have to be in some sort of exchange. And so, we receive grace and try to live in a way that honors God (hopefully by being in relationship with those around us as well as God). OK, so it seems a little difficult sometimes to be in relationship with Jesus Christ. Some of us have really developed prayer practices that put us in direct relationship and dialogue with Jesus. But what about the rest of us who struggle with what it means to be in relationship with the incarnation of God who walked and talked and taught over 2000 years ago? The Matthew passage this week helps a little bit. By being in relationship with the people around us – by welcoming the prophet, by welcoming another, by giving a cup of cold water to the thirsty – we are connected to Christ in this way. Another important teaching that comes from this passage is the example it offers of how simple it can be to relate to another human....how simple it can be to welcome Jesus. No need for a grand cathedral; no need for a pious, theologically correct, properly executed prayer, no need for clothing that match the appropriate liturgical color--welcome one another...share a cup of cold water (like our friend Rick this past week in worship). Are you interested in continuing the struggle of relationship? Do you really trust God enough to follow toward where you are feeling called? What is your role / responsibility being in relationship with Jesus? when I want to run away. and the grand facade, so soon will burn. the heat I see in your eyes. "God uses all things for good." This has become a popular (and we feel sometimes overused) phrase in our culture today. In the face of suffering and tragedy and difficulty and senseless obstacles, it seems there is always someone near that attempts to salve the situation a bit with this phrase. The problem though is that often this phrase is used to wash away the pain of the current moment and get past the problems / difficulties of the present. "Yes, it is horrible that your father died of a heart attack as such a young man, but you know...God uses all things for good." "I am so sorry you were in the car accident and will not be able to walk on your own ever again, but you know...God uses all things for good." "I am sure things are hard since you just lost your job and your mortgage jumped up $1000 a month and your daughter needs braces and your husband is traveling 15 days a month, but you know....God uses all things for good." Now there is no way to get around the fact that the folks sharing this are attempting to offer some comfort. And there is no question that folks are offering comfort by quoting scripture...this bit comes from Romans 8:28 "We know that all things work together for good for those who love God, who are called according to his purpose." But the two-sided difficulty of this is that, yes, often in the long run our current difficulties (through the help of the Spirit of God) help us change and develop in to different and stronger and more colorful products. However, in the moment, being told "God uses all things for good" does not help a new cancer diagnosis. In fact, using this phrase without acknowledging the darkness of what has happened can be insulting to the grieving / injured party. When Paul shares this with us we can assume (from what else we know of Paul’s life experience) he was well aware that “bad” things happen and God does not prevent those “bad” things from transpiring. In Paul’s letter to the church in Rome, he draws heavily on images of Jesus’ death and resurrection. When we give up our old ways, our old lives, our old convictions to follow Jesus’ teachings, it is as if we too have died. But sometimes, it is hard to let go of things and sometimes that letting go seems catastrophic. Can we know that our sacrifices – our radical changes – our personal earthquakes are for good? Or is it beyond us to see and understand that? Can we trust that even though life will involve pain and suffering, “God will use all things for good” in our own lives? The reading from Matthew describes the situation of a true disciple. It doesn’t exactly read like an employment opportunity that people flock toward. Instead, it describes a reality that is turned upside down…son against father, daughter against mother (unless, of course, you are talking about adolescent daughters and mothers) and foes dwelling in the house of their enemy. But there is also in these words a reassurance of God’s love and desire to be in relationship with every human being. Laying this scary description beside an assurance of God’s unending love might be reassuring, right? You, as an individual, have value and are completely loved by God. AND, by extension, that means that everyone else (your father, mother, son, daughter, slave woman, slave woman's son, etc) are individuals that are also completely loved by God....numbered hairs and all. It is not up to any of us as individuals to make the whole story come out just right....it is up to each of us to diligently obey the parts that we have control over and can obey. These scriptures remind us about the importance of obedience; and they remind us about the importance of operating within ourselves and not having a need to control the entire story or make everything come out well for everyone involved. ­ How does the world “obedient” make you feel? Is obedient a word you use to describe yourself? Your relationship to God? ­ Is God present for you daily? How do you know? If not, do you know why not? ­ Think about a time when you did what you knew (deeply knew) you had to do, but no one seemed to understand. How do you describe that experience to others? How were you shaped by that experience? How does that experience continue to affect your life today? ­ How does it feel to know and name that you (we) do not have control over how our stories turn out? “I need your sense of time. Always I have an underlying anxiety about things. And am completely without patience. Because my sense of time is dulled. I measure things in terms of happenings. Have you ever been asked to do something you did not think you could do? Have you ever been given an assignment you felt was beyond you? Have you ever been told something would happen you were certain was impossible? We see you nodding your head. We will wait while you tell your own story. Called. It is a term that some people reserve for those who wear collars and robes and collect their paycheck from the church…people who have been specially prepared and sanctified by some human authority in some way. But throughout history and in every day life, God’s call is present in many, many lives. Imagine it—an old man and an old woman told they are going to have a son…a son that, by the way, would be the first of an offspring that would outnumber the stars. The lectionary readings this week give us a chance to reflect on God’s Divine Possibilities that meet / come up against Our Logical Impossibilities. These folks are all experiencing and responding to God calling them to some specific task in their lives. And they are not particularly well-prepared (and we would argue that just in being called, they are ordained by a higher power). Where do you think all of this protesting came from? Was it because they were against the idea of having a son? Or was it because they did not think they were prepared to do all it would take to have a son? What is the source of their disbelief? Are they afraid? There is fascinating dialogue between God and Sarah and Abraham in this text. It is almost a giddy conversation…and we’re not quite sure whether the conversation is between Sarah and Abraham or Sarah and God. I didn’t laugh. Oh, you did laugh. Why did Sarah laugh? Sarah’s laughter is a gift that she shares with others after Isaac’s birth. Somewhere over time, her nervous laughter of disbelief became joyful laughter. Sometimes the unexpected and unbelievable and frightening ends in mirth. “The harvest is plentiful, but the laborers are few; therefore ask the Lord of the harvest to send out laborers into his harvest." Cure the sick, raise the dead, cleanse the lepers, cast out demons. You received without payment; give without payment. Take no gold, or silver, or copper in your belts, no bag for your journey, or two tunics, or sandals, or a staff; for laborers deserve their food. See, I am sending you out like sheep into the midst of wolves; so be wise as serpents and innocent as doves. When they persecute you in one town, flee to the next; for truly I tell you, you will not have gone through all the towns of Israel before the Son of Man comes." These are exciting and ambitious directions, and they are not the most soothing or encouraging words. I am sure these young people met this challenge with a lot of excitement and passion. But do you think they had any clue what they were setting out to do? Jesus was not mixing words. He told them up front the wonders and excitement they were in for and he told them the dangers that lay out in front of them. But just like with Abraham and Sarah (who we are sure had seen how the lives of others changed when a baby was born), is there any way these followers could have had any idea of what they were agreeing to? And what about the wide variety of feelings that show up when something has been begun that cannot be stopped? The moment of pregnancy and commission are in the line of moments that elicit the “You cannot un-ring the bell” type of observations. Sometimes it seems we find ourselves deeper in to something than we originally planned and we find we cannot go back. Paul offers a little encouragement to those of us who are not always quick to embrace struggle and suffering. He reminds us that our connection to the awareness of suffering comes at a cost and at the same time it creates a new connection for us all. In a Buddhist-sort-of-way Paul draws a (quite logical) connection between suffering and experiencing the Peace of God. This passage continues a dialogue that Paul has been having with the Christian community in Rome about being in relationship with God because of faith and not because of specific actions. (Remember that Paul was a law-abiding Jewish leader whose attention to Torah was great. His “conversion” is an understanding that a person can be in relationship with God because of faith alone. The good work that people do is the OUTCOME of a relationship with God, not the cause of a relationship with God). Paul sort of illuminates Sarah’s laughter for us. In the end, her joyful response is because of her relationship with the LORD. The psalm includes words of commitment in response to God’s goodness. This is a no-holds-barred vow, that especially focuses on the public nature of the response. The psalmist will pay vows to the Lord “in the presence of all people.” In our experience, it’s much easier to commit to something in private. But sharing it with the community puts some pressure on, doesn’t it? God has probably placed a call on your life in some way, shape or form. Some of those calls are very specific or very public. Others are quieter. It is hard to respond to that call from our place of faith and belief or even our sense of duty, especially if it means committing in front of a crowd. As a community, KC seems to be pretty uniquely comfortable talking about commitment. Where does that comfort come from? What does it mean to be comfortable with commitment? How does a community of faith equip its members to receive and respond to call? How have you responded to “a call” that felt beyond your ability? What holds you back from believing what you feel God is calling you toward? "I hate you. You never listen to me. You always think you are right. I cannot go on like this." "I am hurting. I feel like when I offer suggestions they are always rebuffed. It feels like in our relationship, my ideas / intentions / actions / etc are not appreciated. When those things happen it makes me feel like you don't love me. And when I don’t feel loved I don’t feel like continuing to risk loving." Imagine if the prophets of the Hebrew bible had taken classes in active listening or loving communication. Imagine if the words of God had all included "I feel" statements. This week's lectionary selections give us some examples of how the relationship is built (and exists) between us and God. It is often easy for us to assume that the way God is portrayed in the Hebrew scriptures is as a really angry, dictatorial, punitive, non-relational God. God the Conqueror...God the Destroyer...God the Rulemaker (now we are not saying that the scriptures are devoid of this!). But really, we see time and time again the ways that God and humans interacted to both build and destroy Trust. Reading these scriptures we get to observe the relationship being built between humans and God. At the same time, a person can read the New Testament and come away with a sense that all is well as long as You confess Jesus (Your Personal Lord And Savior) died for Your sins – that All was Set Right with Christ’s Atoning Sacrifice (what do all those words mean?). It is also easy for us to create a scene where it is not much of a relationship because we enter the relationship primarily out of fear or guilt. But the truth is we see Jesus and those around him interacting in really meaningful ways and in really intimate relationship with one another. Somewhere in the extremes of relationship and in the space between those extremes, we find our own relationship with God, Jesus and the Holy Spirit. In Genesis we meet a guy named Abram. For some reason (that we do not have in the text) God chose that it would be through Abram that a great nation would grow. Beginning from this place a series of events unfolds through which God asked / told Abram to do something and Abram chose to either follow or not to follow. And really, God opens his relationship with Abram with a shower of gifts. God is building Trust and Love from the beginning by giving and giving and giving. God promises Abram, a man resigned to having no children, the birth of a great nation of descendents. Can you imagine the shock and awe that results from being so wooed? Psalm 33 is a love song from a Human to God. This writer talks about the things that God loves, the things that please God, he talks about the Might and the Power of God.....this is similar to a description someone in a newly-in-love couple might write to one another to attempt to express all of the things that are inside of him or her. It is honest and genuine acknowledgment from one member of a relationship to the other that builds the strength and depth of a relationship. The prophet Hosea channels God as if God is a lover scorned. "I will return again to my place until they acknowledge their guilt and seek my face. In their distress they will beg my favor." Now certainly, this might sound a little adolescent of a response by God, but think about it....I am sure you have had a moment in a relationship of your own when you felt hurt and took the "I am taking my toys home" approach. Based on experience, we know these approaches sometimes get the attention of the other party. Later on God even talks about understanding that Ephraim and Judah were consistently unfaithful lovers...."What shall I do with you? Your love is like a morning cloud, like the dew that goes away early.....I desire steadfast love and not sacrifice, the knowledge of God rather than burnt offerings." Can you see hands tossed up in despair? In Paul's letter to the followers of Jesus in Rome, we see again that it is not requirements that build the relationship stronger. Rather, it is an individual's freely entering in to the relationship with God through her or his own faith that creates depth of the relationship. Paul is reaching back into his own Jewish tradition, using Abram’s call and answer as an example of God’s extending a hand in relationship and a freely willed human hand reaching back in faith. Righteousness is granted to Abram not because of a specific set of deeds or actions or obediences, but because he agreed to be in relationship with Yahweh. The reading from Matthew provides quick descriptions of a series of Miracles performed by Jesus. Each of the miracles occurs, and Jesus enters a relationship. These are relationships built on hope and faith. Those seeking the miracle have a desperate need and are willing to risk their own tradition in order to find what they are seeking. And in return, Jesus reaches out and meets their desperate need – with a compassionate response, not with flashes of lightening or fanfare. He affirms that their seeking him out, that their placing their trust in him, provided a groundwork for a relationship to exist. Jesus took this notion of being in relationship and walked it and talked it as he sat with sinners and tax collectors and the under classes and the diseased. Even with his favored disciple Peter we see so much push and pull…turning toward one another and turning away, but always drawing toward the other. The concept of being in relationship with God is not a new idea…and it is not just a New Testament idea. In relationship, we turn toward another. We extend ourselves even as the other extends to reach out toward us. Both parties must be willing to put something of themselves in to it…both individuals must be willing to share themselves and both must be willing to love and respect and care for what is shared with them. There is no such thing as a “one way” relationship. How are relationships with others in your life similar to your relationship with God? How are they dissimilar? What would you change? How do you reach out to a person with whom you want to be in relationship? How has God reached out to be in relationship with you? Do you trust that God is interested in being in relationship with you? give us also grace that we may fulfill it. Make us gentle, courteous and forebearing. good of the other in word and deed.